The year 2019 has dawned with several enthralling surprises for techies and gaming enthusiasts. Late last year, NVIDIA announced its latest line-up of GPUs—the NVIDIA RTX cards built according to Turing architecture and equipped with incredible features like real-time ray tracing and graphics enhanced by artificial intelligence. Not surprisingly, the announcement caused a massive stir, riveting anyone connected with gaming, multimedia creation and editing, or generally thrilled with superior A/V experiences. The newest line promises performance six times as fast as you have been used to, and that is one heck of a claim. The NVIDIA RTX line is led by the fabulous RTX 2080 card, followed by RTX 2080i and RTX 2070. While RTX 2070 may only be the entry-point into this world of dazzle, it offers a LOT. Packed with 2304 cores (NVIDIA CUDA), this graphics card has a base clock frequency of 1410MHz and a boost frequency of 1710MHz. The imagery it succeeds in rendering is unbelievably lifelike and adds a whole new dimension to your favorite AAA games. 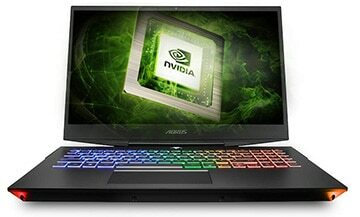 Most leading laptop makers have been quick off the mark in utilizing the splendor of NVIDIA’s most recent offering. The marketplace has already started to abound in multiple choices vis-à-vis laptops with NVIDIA RTX 2070, with ASUS, MSI, Dell, and GIGABYTE leading from the front. If you are planning to make your year spectacular with a new RTX gaming laptop or upgrade your old GTX 1070 laptop, how should you go about it? The Founders’ Edition of the RTX 2070 will set you back by about $599; laptops with this GPU are currently priced at $2199 and above. So, which laptop should you pick to get the optimum blend of features, cost-effectiveness, and future readiness? We will help you find all the answers you need in this detailed review article. For those of us besotted with the high-performing, eager-to-please GTX 1070, making a switch to a premium cousin can be dicey. Is a leap of faith essential? Well, for starters, the RTX 2070 has a distinct edge on account of its path-breaking Turing architecture that allows real-time ray tracing and DLSS (Deep Learning Super Sampling). The resulting multimedia experience is infinitely more captivating. Also, the RTX 2070 card can smoothly let you play at an Ultra HD 4K resolution without loss of detail—something that the GTX 1070 will falter at. The RTX 2070 is also packed with more cores, offers greater memory bandwidth, and, mercifully, employs a superior cooling system to ensure silent but steady performance. The verdict is clear: RTX 2070 cards do deliver the moon, offering a palpable difference when you play at the highest resolutions on maximum settings. However, few games have been announced yet to tap their complete power (read ray tracing or NVIDIA’s favorite brainchild). Until then, your trusty old GTX 1070 card—whose prices may fall in light of recent proceedings—can serve you quite satisfactorily. When you get home an RTX 2070 laptop, you expect nothing but the best in visual splendor and gaming power. These powerful graphics cards promise to elevate your experience in everything to do with multimedia, thanks to their industry-leading design. However, to let you experience the full range of what an RTX 2070 can do, your laptop needs to rise to the occasion. CPU and Memory: Look for an Intel Core i7 and above to play the latest, most CPU-intensive games without any lags or delays. Most gaming laptops in this league offer at least 16GB RAM and 512GB of storage space. You need this kind of memory to house your heavy-duty game files smoothly. Display and Refresh Rate: A substandard display can take away everything from an RTX card. Scout for an FHD/4K UHD screen (Full High Definition/ Ultra-high-Definition), preferably with IPS (In-Plane Switching), anti-glare, and a wide viewing angle. Also, aspire for a refresh rate of 144Hz to let the RTX 2070 card deliver a smooth frame rate and excellent graphics. A lower metric, say 60Hz, will be wholly inadequate. Gaming Keyboard: The ideal facilitator will be an RGB-backlit keyboard with a wide plethora of colors, per-key lighting, and a comfortable key-travel distance. Some keyboards also offer automatic light sensors to adapt to ambient lighting. Portability: A high-power gaming laptop is limited in portability by essence, but you should hunt for a machine that is sturdily built, can travel well, and is stylish as opposed to bulky. Such a laptop will serve you well on outdoor gaming marathons/events. While you are at it, you should also check out the battery backup, device support, and internet connectivity. Some gaming laptops offer up to 10 hours of unplugged usage and up to four USB ports as well as HDMI and display ports. Who says serious gaming machines cannot be light and mobile? 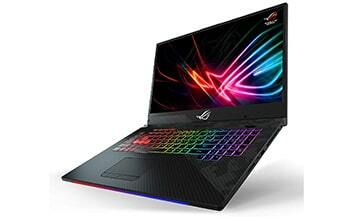 The ASUS ROG Zephyrus S GX531GW-AS76 gaming laptop weighs all of 4.6lbs and is only 0.62” thick. 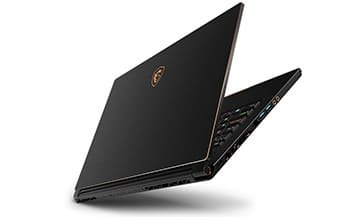 But inside this lightweight, sleek body, it houses an Intel i7 processor, 16GB RAM, up to 512GB of SSD storage, and NVIDIA RTX 2070 graphics with 8GB of dedicated memory. This 15.6” machine also features a stunning display with a refresh rate of 144Hz, a response time of only 3ms, and an FHD screen with an IPS panel. The RTX GPU combines well with the beautiful, thin-bezel display, bringing to life the 100% sRGB color gamut. The 178-degree viewing angle ensures you can game on unperturbed from various positions. The front-facing speakers deliver louder, clearer output. Keeping the performance sustainable is a top-notch cooling system (Active Aerodynamic System or AAS) that employs 12V fans and anti-dust tunnels to dissipate heat. On the connectivity front, you get 802.11 a/b/g/n/ac Wi-Fi and ample USB ports to plug into any peripherals you need, like a mouse. The AURA SYNC keyboard, by the way, is glorious, with customizable backlighting and durability for up to 20 million key presses. 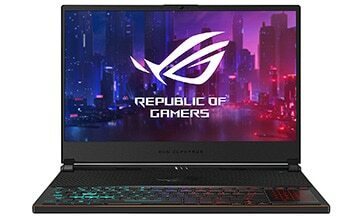 The military-grade construction and the cool magnesium-alloy body make this ROG Zephyrus hold its own in a crowd, while the performance it offers can shush many contemporaries. For larger than life experiences, you need large screens—exactly like the 17.3” ASUS ROG Strix Scar II GL704GW-DS76 gaming laptop that, surprisingly, comes at the same price as its kin in #1. It is driven by an Intel i7 processor and RTX 2070 graphics and equipped with 16GB RAM and 512GB of storage (plus 1TB HDD). Your gaming sessions can be long and undisturbed thanks to the efficient cooling system (Hypercool Pro). 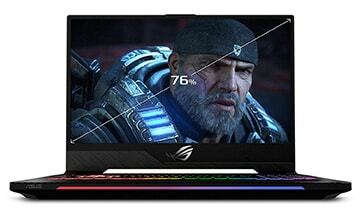 This ROG Strix laptop weighs about 6.5lbs and has a profile measuring 1”. This laptop closely matches the display set-up of the Zephyrus: a refresh rate of 144Hz, a response time of 3ms, and a stunning FHD display with an IPS panel. (Note that the color gamut here is 72% NTSC). The thin bezel design helps create a screen-to-body ratio of 76%. A special word for the keyboard: it offers a large space bar and four hotkeys for better gaming comfort. Internet connectivity is a priority for gamers and a commitment for this laptop. You get 802.11AC Wi-Fi (Wave 2 Gigabit) and quad antennas. The ROG RangeBoost technology helps you receive 30% wider coverage—a difference you’ll notice during competitive online gaming. If you’re looking for a full-purpose gaming laptop that trudges on when many others pause to rest, this premium gunmetal-gray computer (or deep-black) is an excellent choice. When you are sweating it out on the battlefield, the last thing you need is borders limiting your experience. The 15.6”MSI GS65 Stealth-002 gaming laptop understands this and how. Here, you get a display with the thinnest bezel on this list—4.9mm or 0.19”. This, combined with an FHD screen with a refresh rate of 144Hz and a wide-angle view, renders your gaming sessions so captivating you might forget everything but. The response time is a tad higher at 7ms. This laptop is powered by an Intel i7 CPU with 32GB RAM, 512GB of memory, 8+-hour battery life, and NVIDIA RTX 2070 graphics. Build-wise, MSI deserves several laurels for this product. This gaming machine weighs only 4.19lbs—the lightest of its kind. It is about 1.2” thick. The matte black construction (with gold and diamond cuts) is an absolute stunner, exuding the power that this computer houses within. The keyboard on this computer is particularly impressive. It has a silky touchpad that is almost 35% larger than previous versions and supports 10+ multi-touch gestures, better suited to demanding gaming pursuits. With this gamer, MSI has stylishly merged portability with performance, and you won’t be disappointed one bit if those are your priorities too. The final ASUS gaming laptop on our list is the 15.6” ASUS ROG Strix Scar II GL504GW-DS74—an almost as powerful but smaller and cheaper sibling of #2. It delivers speedy and competent performance with its Intel Core i7 CPU, 16GB RAM, 512GB of storage, and NVIDIA RTX 2070 graphics. Here too, you get 802.11ac Wi-Fi (Gigabit Wave 2) with ROG RangeBoost technology for wider coverage than in earlier versions. You can also avail of a gaming-pro keyboard with ROG Overstroke technology and VR-ready ports to plug in all the accessories you desire. As is typical of the ROG Strix series, this laptop also features a terrific display—an FHD screen with a 144Hz refresh rate and a quick response time of 3ms. The color gamut supported is 72% NTSC while the screen-to-body ratio is a remarkable 76%. The display is eSports-ready in every sense to guarantee that you are fully equipped to take on the direst of challenges on the arena. This laptop is quite a looker; it has a lovely brushed finish in anodized gunmetal-gray. The chassis weighs about 5.29lbs with a thickness of 1”. Like they say, when you have it in you, why not show it to the world? Sample the specs first. 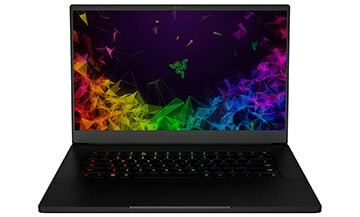 The Razer Blade 15 RTX is a 15.6” gaming computer fueled by an Intel i7 processor, 16GB RAM, 512GB of memory, and NVIDIA RTX 2070 graphics (There is zero bloatware). It has a 4K touch display with a super-thin bezel that measures only 4.9mm or 0.19”, a refresh rate of 144Hz, and a full Adobe RGB color gamut. All this is packed inside an aluminum body with the dimensions of 0.78” x 9.25” x 13.98” and a weight of 4.63lbs. This is the smallest RTX gaming laptop of its kind on this list, and for its sheer compactness and power, it deserves accolades. Razer has ensured that this laptop is as customizable as possible—a trait that gamers hold close to the heart. For instance, the RAM is expandable up to 64GB while the storage space can be upped to 2TB. With specs like that, the performance is sure to be dizzying. But thankfully, an intuitive cooling system (led by a vapor chamber) keeps things sustainable and sane. How about the keyboard? It is a grand one with per-key RGB lighting, 16.8 million colors, and a large touchpad with enhanced precision. Without a doubt, this one is THE choice if you wish to marry amazing performance with astounding compactness. One laptop, multiple triumphs is the story of the 15.6” GIGABYTE AERO 15-X9-RT4K5MP gaming laptop. It is quite a house of wonder with its AUO UHD display (3840 x 2160) with a 100% Adobe RGB color gamut, thin bezel (5mm or 0.19”), and Pantone certification. No wonder then that the level of color accuracy and vividness you get here is rivaled by close to none. This laptop offers ten hours of battery backup—one of the highest on this list—and Microsoft Azure AI. It is also one of the leanest in this league with a weight of 4.49lbs and a profile that is 0.74” thick. The performance delivered by this computer is beyond satisfactory. The Intel i9 CPU, NVIDIA RTX 2070 graphics (with NVIDIA Optimus), 32GB RAM, and 1TB SSD memory come together to create perfect gaming experiences. 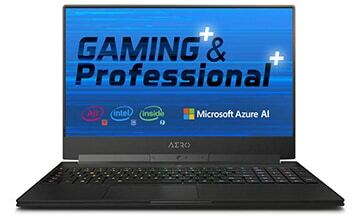 As the world’s first “all Intel inside” gaming laptop, it offers an output that is high in both quality and reliability. 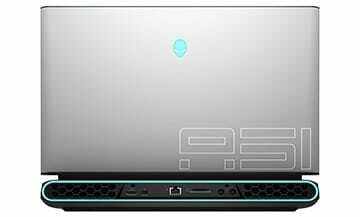 Interestingly, it is also the first ever “Edge AI” laptop which means it can use artificial intelligence to fine-tune everything from the CPU and the GPU to the keyboard and the sound settings (Nahimic 3). A noteworthy connectivity win of the AERO is its Intel-based Killer Wi-Fi; you can enjoy tangibly improved broadband connectivity. Living up to one’s name can be a mammoth challenge (and those of us with demanding families know it only too well). 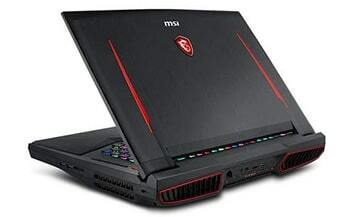 But the MSI GT75 TITAN-014 is a titan in every sense of the word. 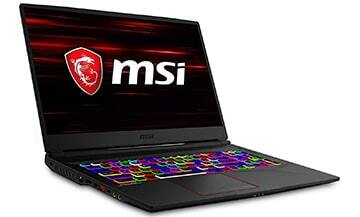 A 17.3” gaming laptop, this TITAN is energized by an Intel i7 processor, NVIDIA RTX 2070 graphics, 32GB RAM, and 512GB of memory (plus 1TB HDD). Additionally, this laptop also boasts of Killer Double shot LAN and Wi-Fi that substantially improves your online gaming experiences. The display on this computer is stellar. You get an FHD screen with a refresh rate of 144Hz, a response time of 3ms, and a full color gamut of 100% sRGB (and 72% NTSC). The screen supports IPS which means you can view it from various angles without facing distortion or a loss of details. The smart display is complemented by an equally smart and comfortable RGB keyboard with 25% faster trigger and per-key lighting. The auditory system, too, is splendid and features Nahimic 3 and a digital-analog-converter by ESS Sabre Hi-Fi. The TITAN lives up to its name even in the build. It weighs a hefty 10.05lbs; its profile measures 2.3”. So, while it doesn’t make traveling a life mission, it does display an unflinching sense of devotion to extreme gaming. Another MSI gaming series worth exploring is the Raider, especially for the well-rounded blend of performance and visual panache. The MSI GE75 Raider-049 is a 17.3” gaming laptop that can double up as both a stationary gaming station and a portable gaming notebook. Making the latter possible is the innovative build with a weight of 5.75lbs and a thickness of 1.1”. Inside rests—or rather works overtime—an Intel i7 CPU supported by 16GB RAM, 256GB of SSD memory (with 1TB HDD), and NVIDIA RTX 2070 graphics. We especially love the MSI App Player for how it merges gaming across mobile phones and computers. The Raider is also known for its fabulous display, and this product does not disappoint. The FHD screen has a refresh rate of 144Hz and a response time of 3ms—ideal for most contemporary AAA games. It supports a full sRGB color gamut of 100% (72% NTSC), with the thin bezel design making the display worth diving deep into. Bonus: This purchase is now available on Amazon with an exclusive promotional bundle worth $300. There is a lot of cool stuff included in the package like an MSI gaming mouse and pad, a string bag, a wired headset, and a gaming controller. You can also get your hands on Battlefield V or Anthem. Welcome to the most expensive NVIDIA RTX gaming laptop on this list. But wait, before that crazy price tag unnerves you, here is what you can expect in the 17.3” ALIENWARE AREA-51M gaming laptop: an Intel i7/i9 processor, up to 64GB RAM, 512GB of memory with a 1TB hybrid drive, NVIDIA RTX 2070 graphics (with G-SYNC), an FHD screen with a 144Hz refresh rate, and Tobii eye tracking. You also get Killer Wireless 1550 and Bluetooth 5.0. Unbending performance is what matters the most to this Alienware, and this is transparent in its processing set-up. The CPU supports astonishing overclocking as it is enabled with 125% rated power. RAM-wise too, this is the first Alienware to support up to 64GB (DDR4). The power is kept long-lasting by an intelligent cooling system that uses dual fans, heat pipes, and copper fin stacks. Heat management is not only effective but also silent. The highlight of this laptop is its provision for Tobii eye tracking—a gasp-inducing feature that lets you communicate with your players through subtle movements such as eye position and head pose. The sheer power of this Alienware comes to the fore through its premium design—magnesium alloy, AlienFX lighting, and narrow bezel. Even so, it manages to weigh below 10lbs (8.54lbs) and have a peak height of 1.7”. Bet that costing doesn’t seem unfair now, eh? Costing you only a tad above $2000 is the 15” AORUS 15-X9-RT4BD—a winsome combination of a high-performing Intel Core i7 CPU, NVIDIA RTX 2070 graphics, and Microsoft Azure AI. The laptop uses artificial intelligence to customize the CPU and the GPU according to your needs, in an attempt to deliver the best performance for the price. A thin bezel display complements this set-up, complete with an FHD screen that has a refresh rate of 144Hz. It rarely gets any better for those looking for a powerful gaming laptop that is also interested in keeping your wallet plumped up. So, how is the processing configuration? The CPU is supported by 16GB RAM and 512GB of SSD storage with a 2TB HDD (wow!). This is ample even for CPU-draining games and delivers a lag-free experience. A persevering cooling system with dual fans, heat pipes, and nine vents manages to keep the heat down as you game on. This laptop is the heaviest on our list at 11lbs. Its profile measures 1”. While the weight brings down the portability quotient, this computer is fortunately well endowed with USB 3.0 ports (four), 802.11 ac Wi-Fi, and Bluetooth. Only a few months have passed since NVIDIA announced the RTX graphics cards, and look at the excitement they have already stirred up in the gaming world! Competing brands are vying against each other with products that deliver brilliant performance coupled with A/V glories, portability, and style. If you are venturing into the gaming laptop world afresh, you will find many a good deal in ASUS, MSI, Dell, GIGABYTE and AORUS. You’d be well advised to take your decision based on the assortment instead of only the GPU. You will be able to appreciate the gigantic performance improvement only if you have been, so far, contentedly running GTX 1070 on your gaming machine. If, however, you are a stranger to the offerings of the GTX 1070—which are super impressive in their own right—it might make better sense to wait things out. An RTX 2070 card and a laptop that hosts one are not inexpensive. But the glamour and grit they can bestow upon your gameplay are, arguably, deserving of the premium.